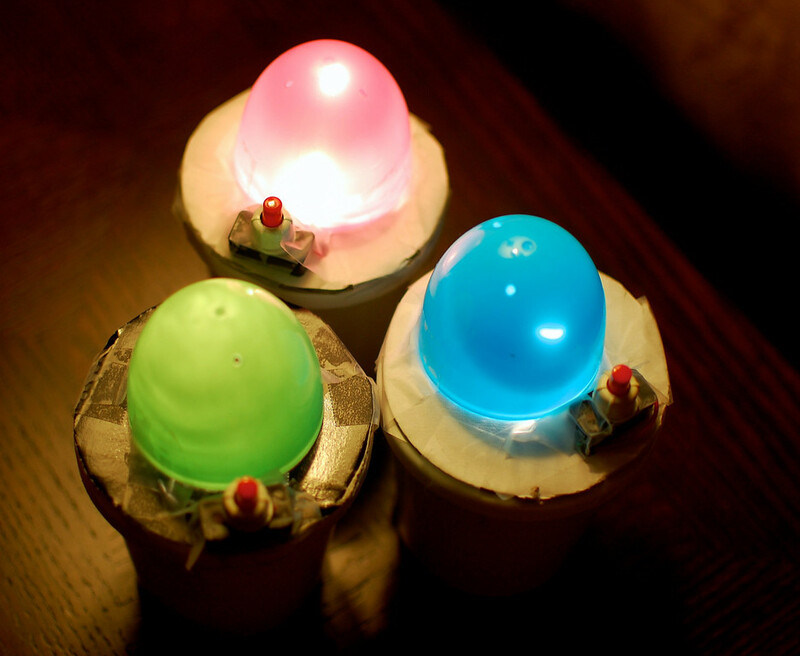 Some portable nightlights the girls and I made this weekend. 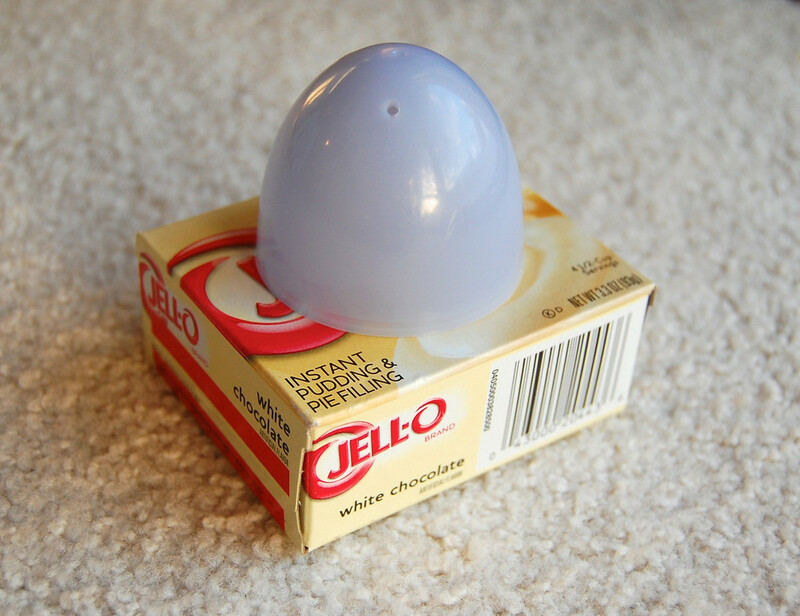 But I remembered in time that this was for children, so it needed to be a little more robust than a jello box. 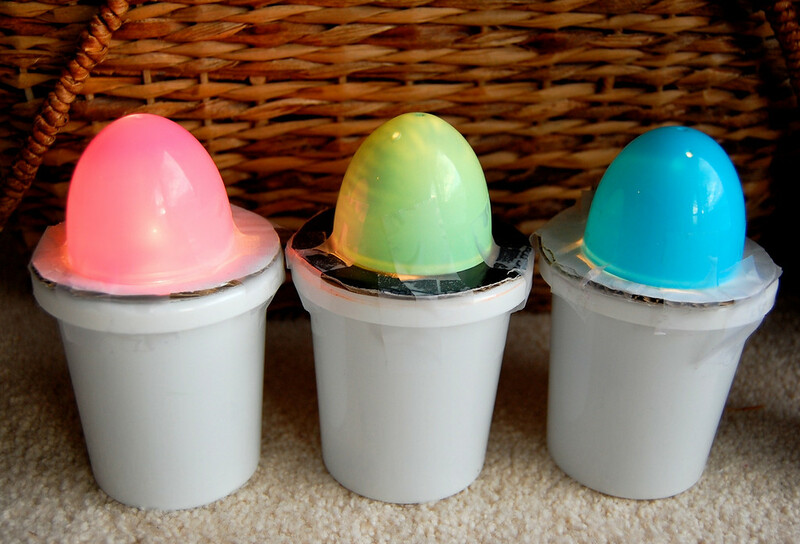 We found some hard plastic cups and hid all the wiring inside them. Then the girls chose half a plastic easter egg each, and stuck it on top with Scotch tape. I buy my circuit components in bulk in Singapore, but I've found them at places like Radio Shack and educational supply stores, as well as online. Some of these store-bought circuit components can be substituted with homemade versions like this bulb holder and this switch. We wanted this to be a stable but temporary set up, so no glue or solder. We just twisted the wire ends together and taped everything else together. 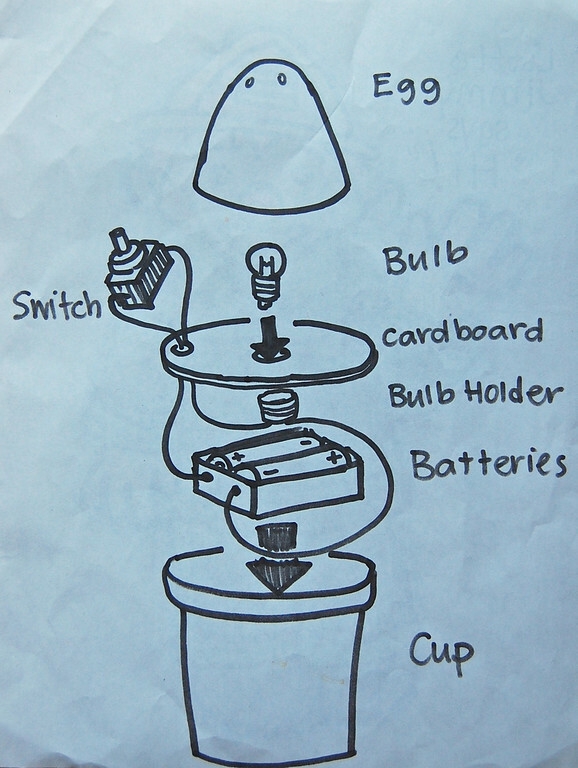 This way I can take everything apart when the kids get tired of their nightlights and reuse my components. And if you connect the circuits in advance, even almost-3-year olds can assemble the housing on their own and feel like they made their own lantern. Emily was very happy to just sit in a mass of wires and alligator clips and practise making circuits. So long as she remembered the Necklace Rule (i.e. closed loops), the bulbs always lit up, which made her happy. If we'd wanted to go one step further, we could have decorated the eggs with markers or stickers to make shadows and pretty patterns. 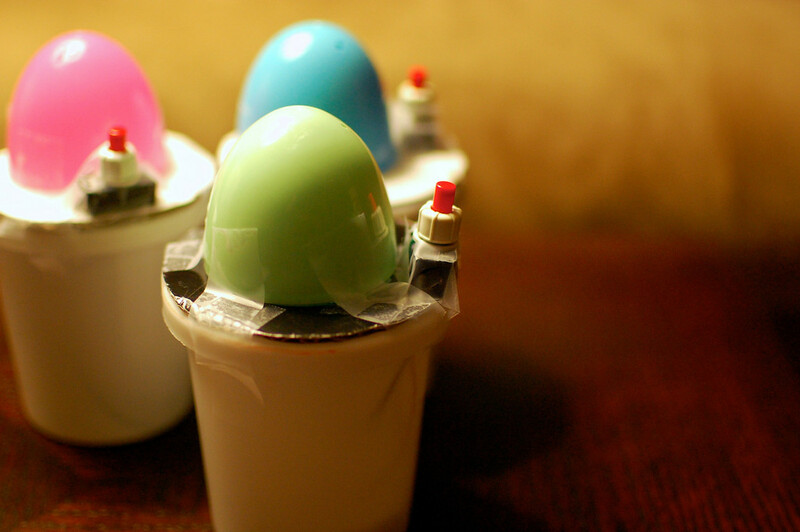 The egg parts are easily replaced by other eggs if your kids want a change of color later. Just remove the Scotch tape and retape the new egg on. 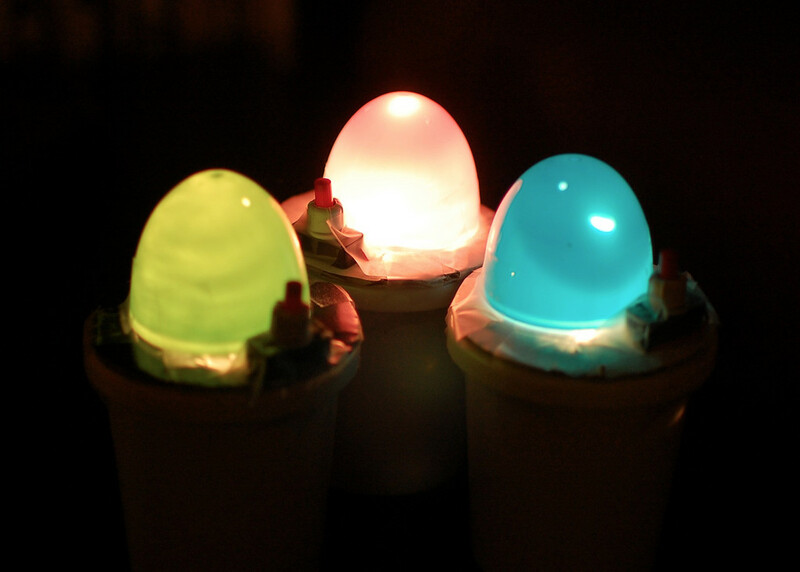 While I could have made a pretty, cleaned-up version for photos, I thought I'd leave these nightlights the way we made them, crudely assembled with tape everywhere - more real. 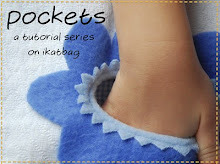 But feel free to dress them up and use neat glue and natural brown cardboard and all that if you make them. The girls took their night lights to bed with them that night. But first they darkened the house and held a dance recital in the light of these little lanterns. Some sewing coming up soon. 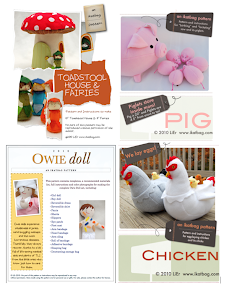 Lots of finished stuff, just too lazy to blog about them. Stay warm, everyone, and hang in there - Spring is just around the corner. They are great ! They remind me of what we did in school in France when I was 11-12. I loved it. Thanks ! Very cool! Thank you for sharing LiEr! I'll have to make sure to invest in some bulk circuitry when I am back next year too. Those are so creative! What a fun and egg-ucational activity. =) Thanks for the how-to, I'll be linking.